← New Basic Braining a Work in Progress: Theme? I’m very selective when it comes to my anime. The list of anime that I love is, nevertheless, pretty lengthy, but even in my favorites, the Japanese-ness inevitably hits a zenith for me, and my adoration is always buffered by an equal amount of bewilderment (which is fine — after all, anime is made for a Japanese audience). The themes of loss and coping in Fullmetal Alchemist are muddied by the random acts of cuteness; the political intrigue of Ghost in Shell: Stand Alone Complex diluted with rampant anti-Americanism and baffling twists (why is the DEA a high-tech violence gang? ); and, in almost every anime, the sudden outbursts of action, relentless melodrama, angsty soliloquies, and exposition as dense as a collapsing star. I like a lot of anime; I understand Eden of the East. The series’ premise is not simple: in 2010 (the series was originally released in 2009), Japan was the victim of a series of missile strikes that ruined large urban zones but, somehow, claimed no lives. Around the same time, 20,000 NEETS (a population demographic ‘Not in Education Employment or Training’ — i.e. unemployed youths) mysteriously disappeared. A few months later, Japan suffers another missile strike. And this time, with no small number of casualties. 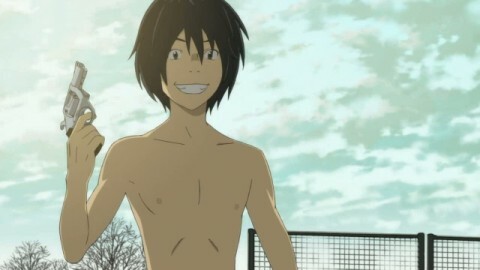 At the time of the series, recent college-grad Saki is on a trip to Washington, D.C. where she meets Akira ‘Taki’ Takizawa, naked and waving a gun around outside of the White House. He has no memory of who he is, how he got there, or why he’s naked and holding a gun — but he does have a cell-phone that gives him access to over 8-billion Yen and a mysterious concierge who seems able to grant any request, no matter how implausible. The two return to Japan together and Taki embarks on a mission to discover his identity. First of all, there are the obvious post-9/11 themes (even a specific reference to ground zero in NY and the Freedom Tower), reflected in Japan suffering its own series of devastating attacks from an unidentified enemy. But that isn’t what Eden of the East is really about. Eden of the East is about the untapped potential of an aimless, but wildly imaginative, generation, struggling to find their place in a society where all the familiar lines they grew up with are being redrawn, forced by the hands of a collapsing economy and increasingly oppressive-yet-irrelevant social pressure. Saki and her friends are all twenty-something college grads struggling to build a small search engine company from its grass roots. The club is a familiar sight for our generation: young people, uninterested in the classic definitions of “career path,” intent on creating their own careers. Then there’s Takizawa — young and idealistic, an eccentric man-child who was given the power to do something great, tried his best, and payed the price. Then there are the 20,000 NEETs, and they’re really what the series is about. Young, smart, creative individuals who lack one important motivator: passion. Society provides no purpose for us; we outright reject the post-WWII ideals that you go to school, start a career, start a family, and die. It’s a question that I can say I’ve wrestled with since I was a child: what’s the point? Some have accused us of being apathetic, but our lack of purpose is a result of society’s general apathy for itself. What’s the point of being a part of that self-sustaining machine? Clearly that machine has already failed to sustain itself, hence the constant state of near-economic collapse we’ve been teetering over for a decade now. The NEET demographic is a more severe issue for Japan, where the cause is an environment of overworking and fatigue that often leads to early death, and the response is a lifestyle that often leads to social withdrawal and, at least in part, the nation’s dwindling population. But, though the term may not be as known here, the issue of NEETs is as much a generational one as a regional one. We see it now in every college grad who can’t break into today’s cutthroat job market, just as Saki, in her job search, is either turned away due to lack of work experience or exploited by slave-drivers because of her lack of options. We don’t know what to do. We were always told to reject apathy and conformity in a world that sustains itself on routine. And so, as a response, we wind up staying in place forever, because we want to reject what society is telling us but we don’t know how — and society is giving us a double-standard to follow: break free and fall in line. And so Takizawa, being a NEET who’s given the power to change the world, fashions himself into a NEET leader. He mobilizes them to do something great. And then society screws him. Finally given purpose in the end, it’s the ingenuity, critical thinking, and information-savvy of NEETs that saves Japan. Takizawa gave them purpose; gave their lives meaning; acknowledged them and their potential; nurtured their ideals — encouragements that our governments, our parents and our elders never gave us. I understand Eden of the East. It’s first anime that speaks to me, as a member of my generation, in a way that few films can even manage. Now if only I could figure out WTF those ghoul-things in Taki’s mind are supposed to be…. Just finished it and we totally watched it the same way. Good synopsis + analysis of the series! Gonna watch the movie now!